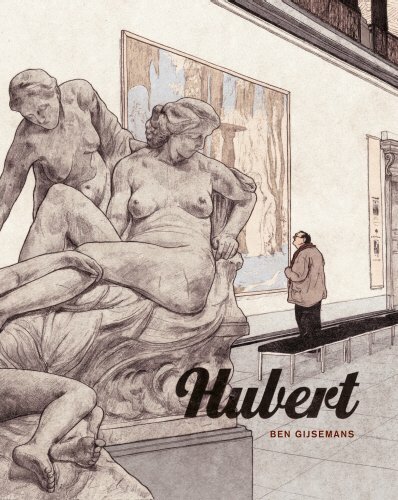 Hubert is the eponymous character in this graphic novel by Belgian artist Ben Gijsemans. Hubert is a little like an “Otaku” (Japanese term for someone with obsessive interests, who stays at home all the time and doesn't have a social life etc). The graphic novel followed Hubert’s quiet routine, mainly consists of going to the museums and just painting copies of photos he took in the museums —mainly of beautiful women in paintings. He hardly socialises and you can see his awkwardness when he interacts with others. The longest conversation he has is with the neighbour downstairs who tries to seduce him but Hubert’s fascination is his other neighbour — a beautiful woman living in the apartment opposite him. This is Gijsemans’s first graphic novel but you can see the maturity of his work in this book. There are no fancy panels or pages in the book — except for one — when Hubert first stepped out of the museum — which the artist deliberately showed a confused looking spread from Hubert’s point of view. Otherwise, each page consists mainly of either a 9-panel grid or a slight variation of it. Yet, it works perfectly in this book, bringing across the blandness of Hubert’s solitary existence. The reader is forced to slowly see each panel carefully and slowly — which Gijseman had drawn exquisitely. There are a lot of subtle details in each panel as it follows to the next panel and the reader will be rewarded for slowly savouring this wonderful graphic novel.